Sulatron records have just released this 2003 (previously available only on vinyl) release on CD with two bonus tracks. 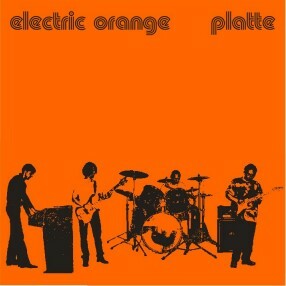 For those not familiar with Electric Orange, they are a mostly instrumental German kraut-psychedelic rock band. They have been making records since the early 90’s and have released a lot of stuff on their own. All of their stuff is recorded in their own studio in Aachen. Kwark (19:55) opens the CD. It is a slow building track with the organ playing the main part of the track as it slowly builds up and kind of keeps you on the edge as you expect they will take off and jam but the closest you get is a Pink Floyd like organ solo as the slow stoned pace continues in it’s mysterious way.. Holzbock is more upbeat and a bit like CAN as this has a very cool, steady groove and some psyched out guitar noodling comes in. Columb takes us back to a slow grooving track like the opening number but a few more stranger sounds are mixed in and the organ plays a more spacey role in the track. That was the whole original record but here we have two unreleased tracks, Dedicated to MK and Flurstück. Not sure if these are from the same era as Platte or not. Anyway, Dedicated to MK is a pretty cool jam with acoustic guitar and building strange sounds before suddenly becoming quite normal towards the end… Spaced… Flurstück, features mainly the piano and organ over a simple manufactured beat. Electric Orange are due to have a new full length release out on Sulatron in the summer and look for them at the Berg Herzberg Festival this summer!